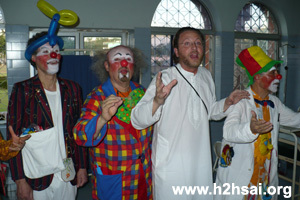 The captivating story of how the ‘Dharmic Clowns’ from Italy inundated the Sri Sathya Sai Institutes of Higher Medical Sciences, at Puttaparthi and Whitefield, with fun and frolic, magic and music, happiness and healing in January and March 2009. It was all magic. 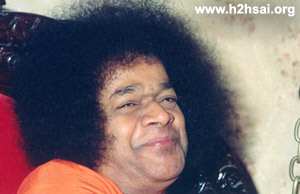 One drowsy and cold winter evening in January 2009, five spirited Sai devotees walked into Sri Sathya Sai Institute of Higher Medical Sciences, Prasanthigram with huge bags, gobs of makeup and cartloads of fun and joy. In the course of the next few days, the otherwise silent wards of Urology, Orthopaedics and Cardiology were ringing with giggles and smiles, joyful shrieks and uncontrollable laughter. The Hospital had been transformed into a hall of overwhelming fun and love… there were no more patients, nurses, doctors or volunteers; everyone had turned into a ‘laughing angel’… the charismatic clowns had invaded the Hospital. And this happened not once, but twice; first time in January 2009 and again in March. From where did these welcome invaders arrive? They had come all the way from Italy, with their most potent weapons – love and joy. As the infiltration began, all that the patients and doctors of the hospital could do was to let go and laugh to their hearts’ content even as these vivacious volunteers put up an awesome and mesmerising performance. They called themselves Dharmic Clowns. But how did they land up in the Sai Hospital? That is a delightful story, and let us get it directly from them. Here is what the Dharmic Clown Group has to say about their birth, blossoming and beatific mission. It all began when our dear friend Marino, a member of the Dharmic Clowns group, told us of an overwhelming impulse he felt, three years ago, to rent a Santa Claus costume, buy some candies and go around distributing them to all the children he came across. It was the Christmas season, and the very air smelt of cheer and conviviality. While he was doing this, one day when he was in the town of Forlì, Italy, Marino found himself at the Pierantoni Hospital. In the pervading hush and quietness, he went from ward to ward until he came to a small door. “Whooooo?” enquired the voice again, sounding slightly incredulous. Marino lost his patience a little, considering that his attire was self-evident. Nevertheless, he went on to respond that he was, in fact, Santa Claus who was out there to bring smiles and good wishes. In that moment, everyone, literally everyone, had a lump in their throats, and their eyes moistened. Only upon leaving the ward did Marino realize that he had entered the Oncology ward. He later found out that the elderly lady died the next day. Marino shared with us this experience and we were immensely inspired. In the beginning, we gave ourselves the name “The Company of Nine”, in deference to the Eastern spiritual tradition that identifies the number nine as a symbol of Divinity. Within a short time, other friends, among whom were professionals from the animation and entertainment industry, joined the initial crew of volunteers. With the growth of the group, our roles became more defined. We then changed our name to “Dharmic Clowns”, taking inspiration from the Sanskrit word “Dharma”, which, in essence, means “duty”. 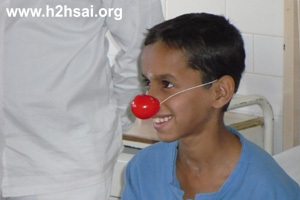 Driven by the will to put into practice Human Values, the essence of which was exemplified in Bhagavan Baba’s aphorism “Love All, Serve All”, we donned “red noses” and clown costumes in an attempt to bring love and happiness to children, the elderly, the sick and the needy. The idea of implementing the clown therapy was not a new one though. There are dozens of studies that show that laughter is beneficial to one’s health, and that it is much easier to heal a happy person. Given all these evidence and our own conviction, soon we started formulating the clown therapy. Games and humour help hospitalised children, their parents, and patients in general, to rediscover their smiles, and the joy of living, at large. Amongst the first to put this therapy into practice was the American Dr. Patch Adams. Today in Italy, the clown therapy has spread rapidly. There are many groups, which practice this mode of healing at various levels in hospitals. We have been offering our service as clowns since 2006. Currently, we perform two days a week in the paediatric ward of the “SaintAnna” Hospital of Ferrara bringing comfort and smiles in the life of children. 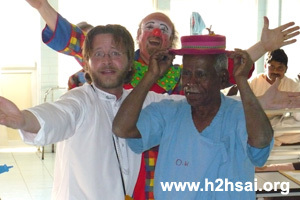 We also regularly perform in various Assisted Living Facilities for the elderly and in orphanages. Additionally, the group offers its services within the context of the Italian Sathya Sai Organization volunteer services, and performs at the national seat of the “Mother Sai” House in Varallo Pombia (Novara), during national and international meetings. Performance is enhanced by regular brainstorming sessions. In order to refine the techniques and the ability to express in the best possible way, we meet once a month for workshops and satsangs (study circles) with professional clowns, magicians and entertainers. Currently, we are preparing a new show aimed principally for children in which they will be the protagonists in the stories that emphasize Bhagavan’s Teachings. For all of this, we are enormously grateful to Bhagavan Baba, our Swami. 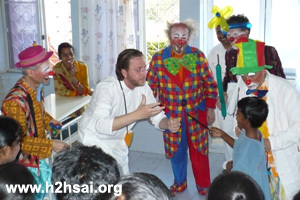 At the end of February 2008, we had the opportunity to perform at the orphanage situated close to the Sri Sathya Sai Super Speciality Hospital in Puttaparthi, where over 80 little hearts lit up with smiles and happiness. Though we knew little English and no Telugu, laughter helped us transcend all linguistic differences to experience a joy that weaved magic and united us in an everlasting bond of love. Our next big moment of collective joy was at the Western Canteen in Prasanthi Nilayam, where children and devotees alike were all agape at the entertaining tricks performed by our group member, aptly named Magic Richard. Most importantly, there was Swami, our Cosmic Wire-Puller and Beholder. We felt His ever vigilant, ever-abiding Presence, through the vivid life-size picture in the shrine before which the show had been staged. 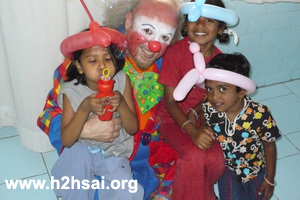 Thereafter, we went along the small paths of the Puttaparthi ashram, amongst many of our brothers and sisters from India and from all over the world, many of whom expected anything but to see clowns in perfect costumes in Puttaparthi! We also shared introspective moments during Satsangs in the ashram, that focused on the meaning of “Dharmic Clown”, on bringing out our ‘inner’ clown, and on reaching out and entertaining ‘from heart to heart’ without having to don the attire. 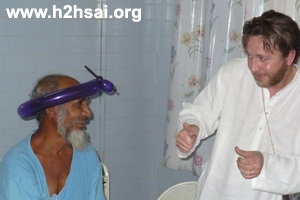 During the Mahashivaratri Festival in 2008, a delegation from our group had been blessed to present Bhagavan Baba with a report of the service activities carried out in Italy in schools and hospitals. In the report, we also expressed a prayer to Bhagavan: to be able to perform at the Super Speciality Hospital, to form the Dharmic Clown Association, and also to create an interactive performance inspired by the Teachings of Swami. The All-merciful Bhagavan answered our prayers, for within a year, in February 2009, we had the good fortune of delivering in the hands of Swami, the Dharmic Clown Association Statute. 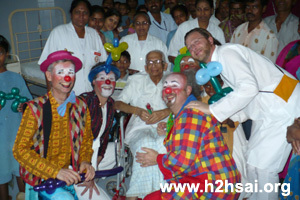 Swami also gave us the permission to perform at the Super Speciality Hospitals in Puttaparthi and Whitefield. 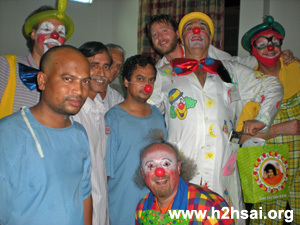 On the afternoon of January 28, 2009, for the first time we crossed the entrance gates of the Super Speciality Hospital, Puttaparthi with our bags full of balloons, clown clothes, make-up, juggling items and magic tricks. We felt a combination of fear and a huge, very huge, sense of gratitude for the opportunity that was granted to us so generously. Until then, we had only read about that sacred place, of that ‘Temple of Healing’, where everyone and everything spoke of Bhagavan’s immense Love and Compassion. We were first met by the Sevadals who looked at us with curiosity. Their faces were writ large with question marks. But in a matter of moments, greeted by hearty ‘Sairams’ and smiles, we felt welcomed in one great embrace: similar in size to that of the architectural form of that massive building. Then we entered the vast shrine, the central dome with its lofty ceiling, and the majestic Murano-glass chandelier, immersed in SAI-lence. We sat on the floor a few minutes to recite the Gayatri Mantra and Samastha Loka… (the Universal Prayer for Peace). Once we were done, we put on our make-up and costumes, ready for the show. We were taken to the Hospital wards. We were met with wide-eyed amazement, even amusement. It was the first time the Hospital had had such unusual visitors! There, at the patients’ bedsides, with the doctors and nurses on duty, we started our performance of magic tricks, balloon manipulation and other assorted gags. The first performance of these Baba’s buffoons was in the Urology ward. Word spread fast and furious. Patients, both young and old, sat up on their beds eagerly anticipating the performance. When they could no longer hold back their excitement, they burst forth with questions. The staff was at a loss to explain anything as they were themselves completely new to the novel phenomenon. “Just wait, and you will soon find out for yourself,” they said, in a futile bid to calm down their wards. Finally, the door opened, and in walked a bunch of people with funny make-up, jazzy costumes, bright red noses, oversized hats and undersized trousers, goggles, bows, et al. The very sight of them sent laughter spreading like wildfire. The clown doctor called for his assistant, who came in huffing and puffing. “Write medicine,” the doctor directed. The assistant was all ears, as the doctor dictated the prescription. “One smile in the morning, one smile in the afternoon, and one smile in the evening. That is all!” the clown doctor prescribed with joy. The patient understood the message and burst out laughing, while the rest of them too broke into guffaws. Winding their way through the corridors, the clowns finally reached the paediatric section of the ward. The sheer spectacle of the clowns capering and prancing in colourful outfits and piebald faces sent peals of amusement tinkling across the ward. The leading clown Richard gestured to his assistant to blow a balloon. 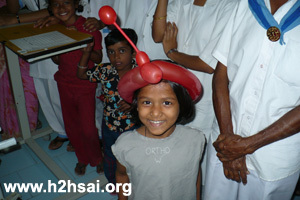 Once the balloon was blown, he twisted and turned it to resemble a dog. With the next balloon, came a hat, then a pair of goggles, a flower, and there was no stopping this clown. There were grown ups too in the ward. Some of them were around 50 years of age. In fact, they were giggling and chuckling, clutching their stomachs in vain. The laughter simply flowed as did the love from these laughing messengers of the Lord. It was then time for some card tricks. A card in hand disappeared the next moment, throwing everyone into a tizzy. Then it appeared in the pocket of one unsuspecting patient, to his utter dismay. Everybody went up with mirth, while the patient kept scratching his head, unable to comprehend how the card ended up in his pocket in the first place. 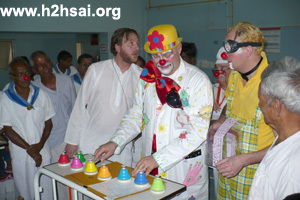 The most enchanting part of the presentation was the clowns making the kids in the ward perform the magic tricks. “What we do, no magic…you also magicians,” they said, inviting the all-too-eager youngsters. And the clowns performed the magic tricks with the children in the front. The young ones were in raptures. As for the clowns, they performed the tricks with such élan that nobody had the slightest suspicion that it was the kids and not them who were pulling off the tricks. “How did you do it?” a startled mother was heard asking her child. The kid hadn’t realised that he had actually performed some magic tricks (with some help)! After a roller coaster of a laugh riot, it was time for the clowns to wind up. But the patients refused to let the clowns go. “One more trick, please. No, not for me, for that kid over there,” an elderly patient was heard saying. Needless to say, it was the older child who enjoyed the fun, though he asked it on behalf of the younger one. Eventually it was time to bid goodbye. The patients let go their angels of happiness most unwillingly, even as they reassured them most warmly with hundredfold promises of return. In the evening we sat pondering over the events of the day – we remembered the three-year old who shrieked in joy and amusement when we touched his nose, and the 16-year old who could not hear and speak but burst into a broad smile when we said ‘Nothing is impossible’, and the tiny tot in the Neuro Surgery department who lay depressed in a bed full of tubes but when he saw us, he smiled in joy and said ‘Sairam’, and also how our tray of seven different bells, each given to a different person, created a special musical game which everyone in the ward enjoyed, and so on. As we sat ruminating over the wonderful events of the day, we realized what a great blessing Bhagavan had showered on us by allowing us to alleviate the suffering of His patients’, at least by a little. In the following days, January 29 and 30, there was great rejoicing in the Hospital. Groups of patients, along with relatives, appeared on the balconies of the wards and greeted our merry company, waving their hands. We were deeply moved and our hearts were aflame with gratitude to our beloved Lord. It was a very intense and magical feeling, a magic that we would have transmitted from heart to heart when we larked among the beds in the wards. 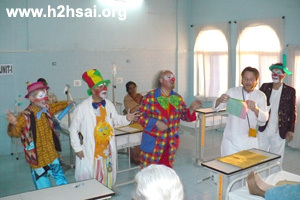 It’s easy then to imagine what our feelings were when we found out we were to return on March 20 and 21 to try to bring some more joy to the patients of the Hospital and then on the afternoon of March 24, to continue to transmit the healing magic of the clown therapy at the SSSIHMS, Whitefield. Finally we would like to remember all: the patients, nurses, doctors, boys and girls that we met, and especially that little boy who shouted repeatedly when he said goodbye to us: “Don’t forget me!” We shall not forget him because that voice is the voice of the little child inside us. What this experience did to the Dharmic Clowns themselves is possibly far greater than what it did to the patients and doctors. Even after returning to their homes, these messengers of magic and love relived every moment they spent in these sacred homes of healing and could never express to their complete satisfaction the gratitude that welled up in their beings towards Bhagavan Baba for the blessed opportunity that had been rewarded with. Even now, they pray and hope to be back yet again to bask in that environment of pure love and pure service that is the Sri Sathya Sai Institute of Higher Medical Sciences.